Skate Lessons. During the fall and spring the Ocean Bowl staff leads group lessons for beginning and intermediate skaters. These lessons are limited to 10 participants to allow for a quality instructor to student ratio. Private Lessons. Private lessons are also available; please make arrangements with the skate staff. More information on programs can be found in our annual Splash publication. Interested in honing your skating skills in a one-on-one setting? The Ocean Bowl’s staff offers private lessons by request. Just call the Ocean Bowl Skate Park at 410.289.BOWL during regular hours and schedule a lesson today! A minimum of 1 – 2 days’ notice is required. Skateboards and safety equipment are available for use at no extra charge during lessons. OTHER: All participants must have a current Ocean Bowl Skate Park waiver on file. A parent or legal guardian must sign a waiver for a minor. *Legal Guardians are those individuals who have been given the LEGAL authority to make decisions on behalf of a minor. Friends of the family, non-parent relatives, etc. who are in temporary custody of a minor may NOT claim legal guardianship. In the event a parent or legal guardian is unable to accompany the minor at the time of registration, the Town will accept a notarized signature on the official waiver form. 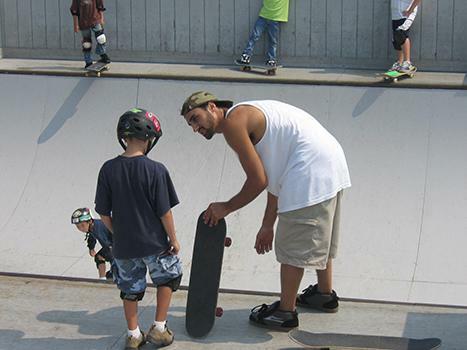 Ocean Bowl’s Skate Lessons use small group instruction to pass along basic and intermediate skills to future X-game superstars! Level 1 – Section A: This Section is for brand new skaters. Skaters will learn to pump, ride, and transition, as well as care for their board. Level 2 – Section B: Designed for skaters who already have a basic knowledge of skating. Skaters will improve the pumping and transition skills. They will also learn to drop-in and ride more advanced obstacles. TIMES: Section A – Level 1: 4:45 p.m. – 5:30 p.m. Section B – Level 2: 5:45 p.m. – 6:30 p.m. PROGRAM NOTES: Safety equipment is available for use at no extra charge during lessons. All participants must have a current Ocean Bowl Skate Park waiver on file. A parent or legal guardian must sign a waiver for a minor. Class Section sizes are limited to 10 participants per class. All participants must have a skate park waiver signed by a parent or legal guardian* on file prior to participating in any Ocean Bowl program.